Toma Sik once said that you can get all you need from a book by reading the first and last chapters. Sik was a Hungarian-Israeli anarcho-pacifist, utopian socialist, anti-Zionist, vegan, world citizen and Esperantist. He had a very extensive library of pacifist books, of which he mostly just read the first and last chapters. In the spirit of Toma Sik, the Pacifist Library is a nomadic library made from recycled and donated materials. In September 2012, on our backs, it traveled around New York City. This library of pacifist texts created spaces for the exchange of radical ideas in the streets through a reading area, encounters, performances and actions. A couple of years ago, we were working on a project about intentional communities. We spent a lot of time on the Intentional Communities Directory website, and it got us thinking about the ways in which hopeful communitarians found each other in the days before the Internet. Toma Sik, in turns out, was a key figure in the pre-Internet communal network. He developed a nine-scale survey with which to gauge one’s communal readiness and with which to approach either existing communities or potential partners. The survey included questions ranging from diet to income sharing. As our interest in Sik grew, we started to contact and interview people who knew him. In one interview with Uri Davis — Sik’s lifelong friend, a fellow antiwar activist and the first Jewish member of the Revolutionary Council of Fatha — he described Sik’s Tel Aviv apartment, nicknamed “The Boat,” as being a central meeting point for activists and radicals in Israel, as well as having a huge collection of trash. The books in the Pacifist Library are donated and reflect a wide range of interpretations, understandings and provocations of the library’s theme. Books leave a dusty corner of someone’s shelf, arrive to us and become part of the library’s collection. The books thus take on a new life: They circulate, ideas begin to recirculate, new conversations open. By accepting, recycling and reusing other people’s contributions to the library without judgment, we hope to form a pacifist library in both concept and content. On any given evening at Sik’s apartment, there were a handful of Israeli dissidents, war-resisters and pacifists digging through piles of papers and books. Sik would be in the crowded little kitchen preparing a supper of overripe, discarded vegetables that he’d picked up at the close of the market down the street. Someone may have started looking through a book by the Pashtun freedom-fighter Khan Abdul Ghaffar Khan and a conversation on his strategies ensues. Suggestions are made about how to apply them in the nonviolent battle with the Israeli military at checkpoints, plans are drawn up and the next action is sketched out. The book was a pretext, its function was a catalyst for conversation, and then for action. This is a key job for books and for a library. This is why we take to heart Sik’s statement about reading just the first and last chapter of a book. We need just enough from it to instigate us into an exchange. Most libraries are physical spaces defined by geography. When these fixed-space libraries have a system of lending books, they are called circulation libraries; it is understood that those who frequent lending libraries may not find the space of the library suitable for reading the books that they found on its shelves. A reference library contains a collection that is so valuable that it isn’t allowed to circulate; visitors to such libraries must do all of their reading and research in the library itself. But there are other kinds of libraries, too. Ten years ago, one of us volunteered on a library bus in the Guatemalan highlands. The bus moved between villages on a weekly schedule, stopping for a few hours so that children (and sometimes adults) could come and use the library and search for books. The library had the physical space of the bus to define it, but the library was not defined by space — it was defined by time. The books became the event for which children from the village would congregate at a specific time to share the excitement. When a book becomes an event it is less likely to be read in solitude and isolation. 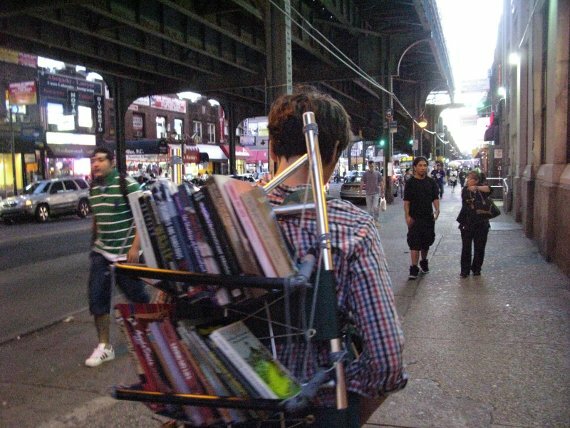 For the Pacifist Library, we carry the books on our backs. We modified two vintage aluminum external-frame backpacks into mobile library bookshelves with some PVC pipe and fabric. The library is nomadic in that it moves with us where we go. We circulate with our books, but the books don’t circulate. We carry with us a straw mat, a stool and a thermos with mint tea. With these simple objects we invite people to utilize the library wherever we happen to be — on the street, in a park, at a local library. With an invitation to browse our collection, we also offer an invitation to join us in conversation. 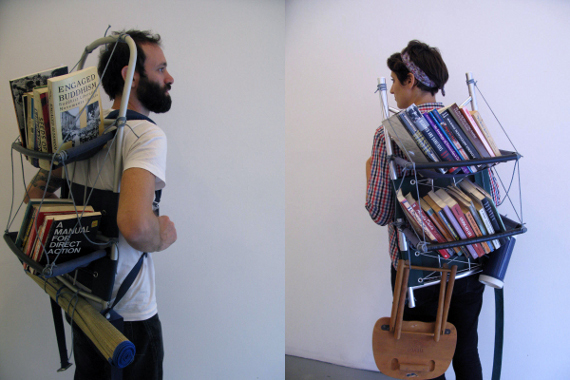 It isn’t easy to anonymously browse a bookshelf when that bookshelf is on someone else’s back. In this way, the library becomes social. A quick look through the books open a conversation about a title, or the selection, or the books’ weight. It is these moments that we are looking for in the Pacifist Library — moments when the books become instigators. As we traversed Queens in September, that diverse borough offered an exciting canvas across which to circulate the Pacifist Library. With the help of the Queens Borough Public Library’s New Americans Program, we had an itinerary and invitations to visit various libraries. The borough of Queens is home to immigrants from all over the world, and many of them carry to New York experiences of oppression and social change. We were eager to encounter people in the borough with such a great richness of life experiences, and to share a story over a book and some tea. During one afternoon outside the library branch in the neighborhood of Flushing, we were accosted by an elderly lady who picked up a book about the Berrigan brothers, looked at it briefly and asked us with surprise how we managed to get permission to present pacifist books at a public institution. Wrongly sensing that she was sympathetic, we replied that we ourselves were surprised to have been invited by the library — at which point she started to assault us with insults, ending with a vow that the United States will bomb all pacifists. A few minutes later, and still shaken by this confrontation, we were approached by a gentle Chinese lady who picked up a book by J. Krishnamurti and introduced herself as Dr. Lotus, a prominent cancer researcher and Falun Gong practitioner. She spent the rest of the evening in our company, sharing scallion pancakes and telling us of the persecution of Falun Gong in China and the negative attitudes toward them from Chinese-Americans as well. The Pacifist Library is a dialogic space, where people of all perspectives can enter in conversation. The Pacifist Library also engages in direct action. The libraries of Queens offer books in hundreds of languages and dialects. Yet a quick search through the online database doesn’t bring up very many books on pacifism, nonviolence or social change. As a litmus test, we ran a database check for political theorist Gene Sharp’s book From Dictatorship to Democracy, which outlines a conceptual framework for the nonviolent overthrow of dictatorship and has been used in prodemocracy movements worldwide. The book is free from copyright and free of cost. We were surprised to find, however, that this widely read and used book was not available at any of the branches of the Queens Library, nor in Manhattan, Brooklyn, Bronx or Staten Island. In response, we decided to take action: to print and bind copies of the book in all 30 languages in which it is available and donate them to the branches of the Queens Library. We thought that we’d have to make a guerrilla donation, sneaking the books onto the shelves while visiting each branch. Fortunately, though, we found a receptive branch that accepted our donation of 12 of the 30 translations and would distribute them to branches that carry books in the respective languages. Believe it or not, we weren’t out to promote any ideology. As artists, our interest is in creating a space in which to open dialogue, and the Pacifist Library was the context in which we sought to instigate a conversation. The Arab Spring brought to our attention, as well as to that of so many others, the struggles that a large portion of the world is engaged in and the great potential for nonviolent social change. With this impetus we set out on an artistic inquiry into the ways in which to bring the topic of nonviolent struggle into the public space. Debbie McDonald Isaacson What a wonderful idea! Glen McGuire That is so cool. I knew and appreciated Toma Sik from many wild meetings within the War Resisters International. This article, and – more to the point – this work is a very fun and fitting tribute to the ongoing legacy. Bravo!